Joyeux Lundi, mes cheres! I hope everyone’s weekend was, shall we say, parfait. Last night we were supposed to see the comedy show “How to Become Parisian in One Hour” but that is story for another time….which will be never because I AM NEVER LEAVING. Today, I’m so happy to have the inspiring Santa from Homestilo sharing some sneak peeks of her beautiful home (check out her view!). While Mademoiselle Erin is out enjoying herself in The City of Lights, I’m happy to be with you today, sharing a look at some of the things that make my home…well, my home. We honestly make the bed everyday (and by “we” I mean me, of course). I find it’s just a great feeling to end the day with some sort of semblance of order and neatness. No matter how crazy the day was, no matter what chores didn’t get crossed off the list, a made bed is always a pleasant way to end the day. On my nightstand there is usually a pile of magazines waiting, for months on end sometimes, to be read. I also keep a copy of one of my favorite quotes attributed to, oddly enough, Elsie De Wolfe: “Be pretty if you can be, be witty if you must, but be gracious if it kills you.” Words to aspire to. Our home and its colour palette are quite neutral. But neutral can be just as fun. 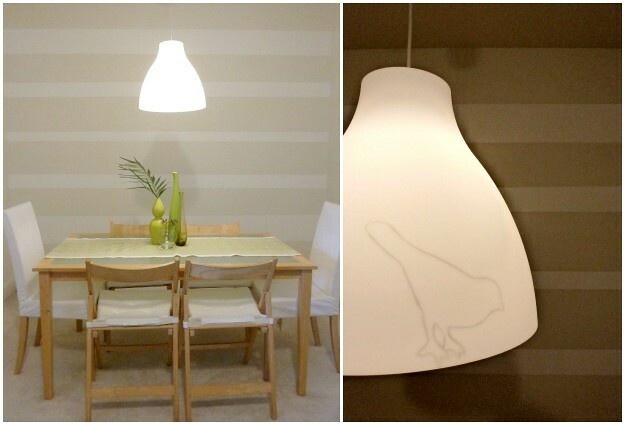 I tweaked the old IKEA Melodi lamp with a few birdie silhouettes. Then once, while my husband was out of town on business, I went ahead and added stripes to the focal wall. The hubster wasn’t completely sold on the look, but the stripes still make me smile whenever I look over at that wall. The main thing that sold my husband on our current home was the view. We live in an apartment and our outdoor space is limited to a balcony. But we do overlook a golf course which gives one a sense of having a much more grand outdoor area. 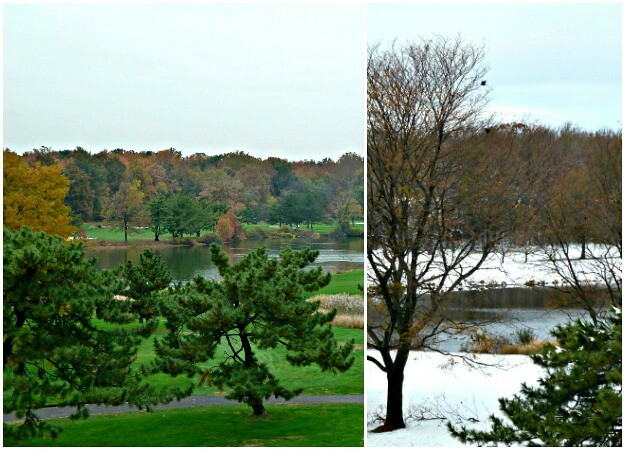 We always have a view of the perfectly green lawn during the warm months and a ‘Winter Wonderland’ after snow fall. It’s also great for gazing out of first thing in the morning or in the middle of the day, when one needs to gather her thoughts. So, that is a small look at our home. A big thanks to Erin for having me over and for making me take a moment to appreciate my surroundings. Is it weird to say that someone else’s bed looks snuggly? Santa’s totally does, though! I love the simple touch of stenciling a bird on a lampshade. So clever and creative! Thank you so much, Santa! i live right next to a golf course too! i like to pretend it’s my “grounds” sometimes ; ) i like the accent wall stripes! and how did you get that perfect little bird on your lamp? it looks like it came that way, so cute. ooo, i love the quote too, it’s a good one. xo santa and erin! Oh wow what a lovely view! I bought our flat because of the view from the balcony too but it’s not quite as pretty as that. I have always love that quote and you’re so smart to have it out where you can always see it! Erin’s right, your bed looks super snuggly! I’ve loved seeing this glimpse into your home. I love the homey feel of Santa’s home especially the bedroom. And what an awesome view! I also live in an apt. and am lucky to have a balcony as well. While we don’t have such a verdant view, we can see the garden downstairs and the Brooklyn Bridge from ours. Oh, your view is amazing! We only look out to a dumpy backyard. Hopefully that will change with the addition of a privacy fence…I have to agree with Erin, you bed does look snuggly. Love the quote you keep on your nightstand. And kudos to you for painting the stripes, it looks great! Thanks for the tour Santa! Erin: Have a wonderful time in Paris, I’m envious. Santa: I too have to have the bed made every morning. We live in an unattached house, the view out the back slider is what sold us on the house. I love your view! Santa – those sheets! Where’d you get them?? Hi, Santa! So nice to see your beautiful home here. Your bed looks really comfy (and is making me sleepy). I also make my bed every morning. I love the feel of throwing back the covers of a made bed each night. Your striped wall and view are quite lovely, as well. I can understand why each of them makes you happy when you see them every day. Thanks again Erin for having me. And thank you all for your lovely comments on my little ‘ol home! @Rooth the duvet set dates back a few years and it’s form IKEA. Santa, your home is beautiful! Rooth beat me to it by asking where you got those sheets because I adore them (I too make the bed every morning – there is nothing worse than getting into an unmade bed)! I also really love your stripes in your dining room (talk about a labour of love)! 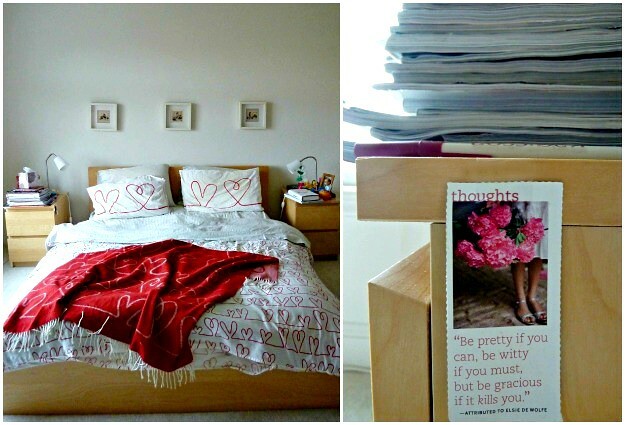 We have the same night stands :-) Thanks for sharing your gorgeous home, Santa! lovely home & a view to die for… wish i could be so diligent to make the bed every morning, but i’d be lying if i said i did!